According to Airtel:- Now this is the kind of bonus you’ve been asking for. 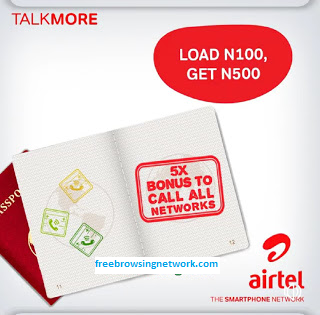 Get 5X bonus to call ALL networks On Airtel TalkMore. Recharge and dial *234# to enjoy! It's very simple, just like how Airtel stated it. All what you have to do is to recharge your Airtel line with atleast ₦100 and dial *234# to enjoy the amazing 5x bonus to call all networks in Nigeria. Comment on "How To Activate Airtel TalkMore 5X Bonus"